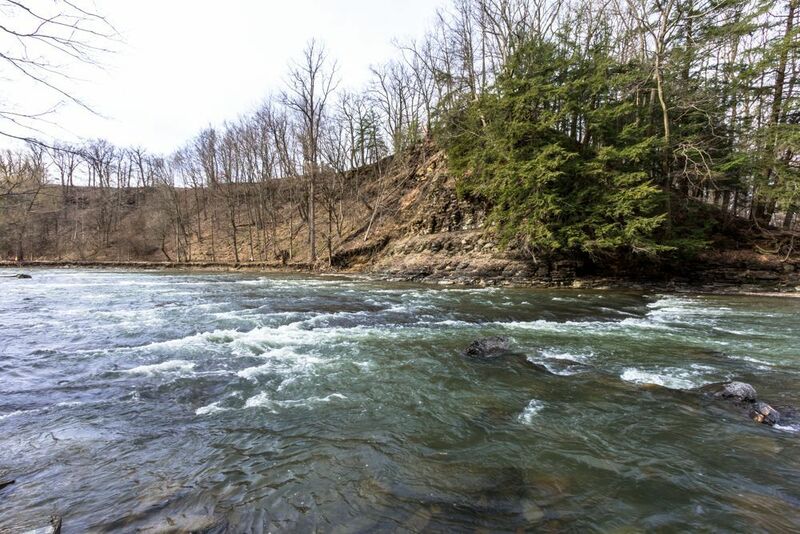 Thanks to the rain of late October, the creeks of Western New York are their old selves again—big, river-sized, rushing waterways with little Niagaras of rapids and pretty waterfalls. The biggest is Scoby Dam on Cattaraugus Creek, a 40-minute drive from Buffalo at the Springville exit off Route 219. From now until Christmas and beyond, until the ice gets too treacherous, Scoby Dam and a few other creekside sites will host a seasonal migration of big, colorful lake-run trout and the people who seek them. But the scene is not for anglers alone. There is still color in these protected gorges. For creek-walkers, the real treat is closer to Buffalo. Take Route 5 to Eighteenmile Creek, and you’ll have two options. To the west barely a quarter-mile is Old Lake Shore Road, where just a few yards back toward the creek, there’s a place to park and paths that will take you downstream toward Lake Erie, or upstream past riffles, the Route 5 bridge, and a beautiful serpentine course of paths that are best navigated with Wellies. To the east a mile or two is Hobuck Flats, now a pedestrian bridge, at the end of Versailles Plank Road. Sneakers will do for the miles of muddy paths along the twisting, various, protected scenes of shale cliffs, oxbows, wide flats of igneous rocks and surprising limestone formations that tell more than most of us want to know about the geology of moraines and ice ages and the astounding ancientness all around you. Be ready to feel humble at the presence of 400 million years of life-forms all around you. If you’re either skilfull or fortunate, you’ll get a look at a steelhead. There are plenty of them in the four- to six-pound range here, big, two- to two-and-a-half feet long. The water can be turbid the day after a storm, or clean and clear and sparkling the next day. For hikers and anglers alike, the best advice is to play hookey on a weekday morning, just for a couple of hours, and avoid the weekend morning crush of trout-seekers. On clear days, you can see the fish hovering in the pools below the ancient shale cliffs. If you’re lucky, you can follow the flashing silver as they charge up riffles so shallow that their backs show in the sun.